The first piece of advice to ignore if you want to keep from selling your restaurant is to ignore the broker’s advice for the listing price. A Certified Restaurant Broker has the experience, the knowledge, comparative analysis and sales to support the listing price he is providing to you. This important reliance on comparable sales and lending approvals tells him what the business will sell or lend for in today’s market. Join this with years of experience and he or she is most often, setting the correct pricing. 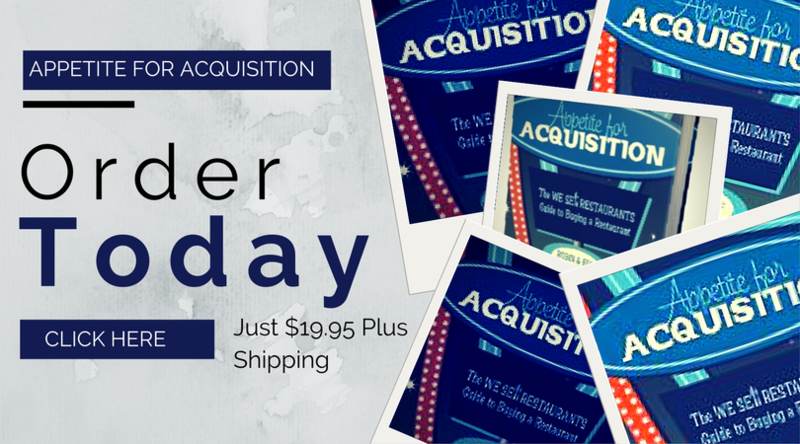 As the seller, you’re relying on what you “need” or “want” for the business. Buyers are not interested in what you need from the sale or what you want for the business. They are interested in obtaining a business in line with current market conditions for similar businesses with comparable earnings. When you tell him or her that even though it should be listed at $225,000, you want to list at $270,000, you’re setting up a scenario that will keep from selling your restaurant. This is the first rule to put in place if you want to delay a sale and set yourself up for disappointment. Taking your eye off the ball is never a good idea, especially when selling your restaurant. Just because it’s listed with a Restaurant Broker doesn’t mean the deal is done. Typically, you have months of waiting before the closing takes place. It’s not the time to slack off, in fact, it’s time to up your game. You will have buyers visiting as secret shoppers and determining if they want to move forward. We coach buyers to understand that they are always buying a work in progress and any improvements will lead to a better bottom line for them. However, if last years’ service record was impeccable and you’re shorting people on night shift to save a few pennies, it will show. That leads to buyer questions. Buyer questions lead to negotiated deal terms and ultimately, impacts the value of your business. Keep the operations at the same level as prior to listing your restaurant for sale to get the best offers. Forget About Driving Sales; They Don’t Matter that Much, do They? Another surefire way to torpedo a sale and keep from selling your restaurant is to start posting negative sales comps. Positive sales are a requirement, not a suggestion. Above all, stop the bleeding somehow, if you start heading into negative sales territory. As restaurant brokers, we work with lenders who want explanations or deny loans because of sales trending. Strong restaurant brokers can help a seller craft the right message about why the trend is dropping and help save a deal. A better option is to never put yourself in this box unless you’re not that interested in selling your restaurant. 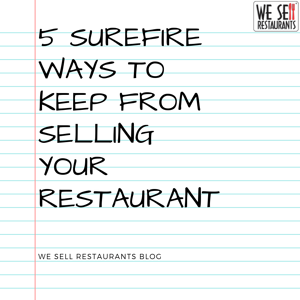 Figure out a way, whether through promotions, advertising, delivery, catering or somehow, to get your sales posted in positive territory until the restaurant is sold. Here’s another favorite if you want to be certain to stop all the momentum for selling your restaurant. Begin ignoring the tax man and the payments for payroll or sales tax. If you think these items are not going to surface before the closing, you are dead wrong. All attorneys preparing closing documents should be doing a UCC (Uniform Commercial Code) lien searches. That will usually uncover any unpaid debts and liens. Since taxing authorities are usually the first to file, these liens will show up. Any liens will have to be paid out of the closing or settled in some manner before you can sell your restaurant. The fact that the liens exist also raises serious doubts in the mind of any buyer. Can you be trusted if you don’t pay your taxes? What other bills might surface? Even if a buyer wouldn’t be liable for any unpaid bills, this tactic introduces doubt. This breeds distrust which leads to deals falling apart. Pay your bills and pay your taxes if you are selling your restaurant. Avoid making payments and you’ve set up a surefire way to drum up to lose a deal on top of wasted penalties and interest. There’s really nothing you can tell a restaurant broker that he hasn’t heard before. What they can’t help with is what they do not know. If a pipe breaks and you close the restaurant for two weeks while it’s in contract, that’s a very material matter that should be disclosed. If your wife caught you with the night manager in a compromising position, it’s embarrassing and should be no one’s business but your own. However, if a buyer is likely to hear about it, the broker should know. Any situation can be managed if the broker is in the loop. Be less than honest or hide something and it will certainly surface. That’s another surefire way to keep from selling your restaurant. There are, unfortunately, many ways to sabotage the sale of your restaurant. Avoid these for a successful transfer. Need help selling your restaurant? Reach out to us at the link below.